Bheemeshwari, located in Mandya district of Karnataka, is a place packed with loads of activities, all in a small town located approximately 100 km from Bangalore. If you are craving to do a lot of adventurous as well as laid back activities to break your routine monotony, then pack your bags to Bheemeshwari now! It is known for being an ecotourism spot, as the river Kaveri here is a natural habitat for Mahseer fish, one of the finest game fish in the world. For the same reason, Bheemeshwari is famous for its fishing camp, and tourists usually stop for the fine fishes. Apart from the fishing camp, Bheemeshwari is a perfect spot for numerous adventures such as white-water rafting, trekking, kayaking to name a few. 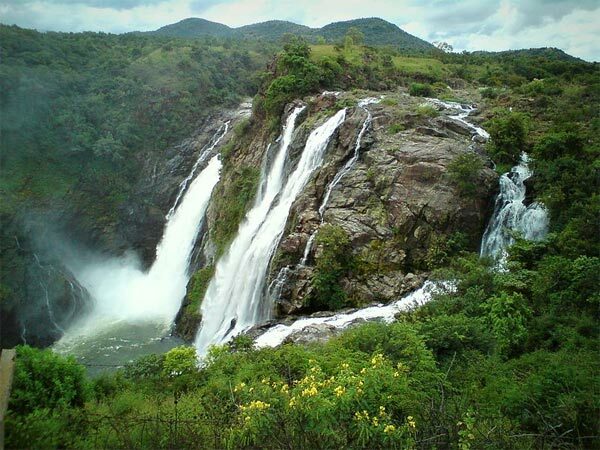 It is essentially located between the Shivanasamudra Falls and Mekedatu. The best time to visit Bheemeshwari is from October to February. Route 1, which is the fastest route, goes via Kanakapura. It is a small town with a number of waterfalls and natural spots around it. This town found on Route 3, which is famous for its wooden toys' craftsmanship, has a number of interesting places to visit. Some of which includes Bidadi, Ramanagar, and Aprameya Swamy Temple . It is also well-known for its excellent silk and coconut products . About 22 km from Channapatna is the town of Maddur, situated in Mandya district. Vaidhyanatheswara temple, which is about 3 km from Mandya, is a serene temple that is dedicated to Lord Shiva. Perched on the banks of river Shimsha, it is surrounded with beautiful green paddy fields. Maddur is extremely famous for its delicious Maddur Vada, a specialty snack made of semolina and onions, which you must stop to try without fail. A drive of 13 km from Maddur will take you to the village of Kokrebellur, that has the well-known Kokre Bellur Pelicanry. This bird sanctuary houses the endangered species of Spotted Billed Pelican, along with other birds such as Painted Storks. The village gets its name from Painted Storks, which in Kannada is called "Kokkare" and "Bellur" means village of jaggery, due to the abundant production of sugarcane. The district of Mandya that is on the way to Bheemeshwari, is 19 km from Maddur. Mandya is famous for Krishna Raja Sagar Dam (KRS), Brindavan Gardens situated at the base of the KRS Dam, Govindanahalli, Adichunchanagiri Hills and Melukote. However, these places will take an entire day to be visited, so plan for a stay if you want to spend time in Mandya thoroughly. Situated at a distance of 60 km from Mandya and roughly an hour from Bheemeshwari, is the majestic Shivanasamudra Falls. It literally translates to "Shiva's Falls", and is one of the most popular tourist hotspots. River Kaveri flows down from a height of 90 m , and gets divided into two segments, known as Gangachukki and Bharachukki, collectively called as Shivanasamudra Falls. The currents are so fast that it has Asia's first hydroelectric power station, set up in 1905. This magnificent waterfalls must be visited between August to October, which is the peak season. Also known as Muttatti, it is located on the banks of river Kaveri in the Malavalli village. Muthathi is a scenic treat to the eyes with the view of Kaveri river surrounded by lush green grass and trees all around the water regions. It is a perfect setup to just lay back and enjoy the view. Since the water currents are quite high, it is recommended not to swim in the river. An hour's journey from Muthathi leads to Cauvery Wildlife Sanctuary, sometimes known as Bheemeshwari Wildlife Sanctuary. The river Kaveri flows here through the beautiful deciduous forest. It is home to many species of trees and animals such as Malabar Giant Squirrel and Grizzled Giant Squirrel, which come under the highly endangered categories. Apart from these, the sanctuary houses 280 bird species as well as many species of reptiles. Basavan Betta (hills of Nandi) is also found in this forest. Bheemeshwari is famous for having the best adventure, nature and fishing camps in Karnataka, and it is the place for all kinds of sports and adventure activities. It is set on the banks of river Kaveri, with the Western Ghats as its backdrop. White water river rafting is a favoured sport in this region, with swiftly changing and gushing currents of the river Kaveri. July to September are the perfect months for this activity, as the river will be filled with monsoon rains. Angling is another activity that can be done here, especially for those who love fishing, due to the abundance of Mahseer fish in the region. With the association of local camps, fantastic wildlife treks can also be done. Coracle rides and kayaking are two other fun sports that are available if you're looking for a much relaxing yet adventurous kind of activity.